Product #60773 | SKU 38011 | 0.0 (no ratings yet) Thanks for your rating! High-capacity portable power station, equipped with over 3000Wh of lithium battery storage for long run times on all your necessary equipment. The Goal Zero Yeti Li 3000 Portable Power Station is equipped with over 3000Wh of lithium battery storage for long run times on all your necessary equipment. 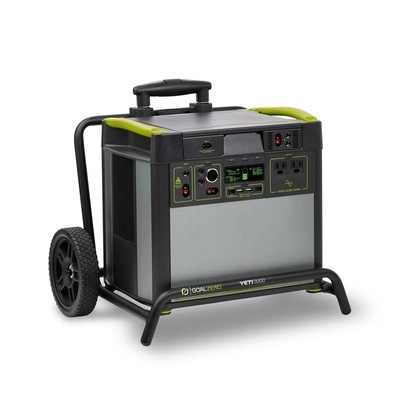 The Goal Zero Yeti 3000 is the epitome of on-demand power at the push of a button, a clean alternative to a gasoline-powered inverter generator that produces 1500W of continuous power and a 3000W surge for running high-power devices. With 10 versatile ports to pick from, a Yeti keeps all the necessary gear powered up anywhere. It features higher surge capacities for greater compatibility with more power-hungry devices, and the latest in USB-C Power Delivery capable of charging larger USB devices like laptops. Now with WiFi connectivity, simply connect a Yeti through your WiFi router and control it remotely using the new Goal Zero Yeti App. Turn ports on or off, check battery levels, even update the Yeti’s firmware with your chosen device. The Goal Zero Yeti App is available now through the Apple App Store or Google Play Store. Includes pre-installed solar charging optimisation module that functions as a maximum power point tracker (MPPT), resulting in up to 40% faster charge times, especially from solar panels. Every Yeti is built with quality lithium cells, known for stability, monitored by a state-of-the-art battery management system that prevents over-charge, over-current, and short circuiting. The battery pack is enclosed in a water-tight enclosure that seals it from the elements and allows for a user-replaceable system, lending to the overall longevity of the product.